However, recently I got a letter in the mail informing me that my Better Homes & Gardens magazine subscription was running out, and the time to renew was now. Isn't it always?! Part of the offer includes two gift subscriptions, but pretty much everyone I know that would be interested in reading that magazine already does. And after your responses on my last post about our bedroom, I realized...hey they have homes! And gardens! And they like to make them better! So, instead of just letting those subscriptions go to waste and only renewing mine, I thought I would do a little giveaway with them here on my little website. I feel like I should make if clear that Better Homes & Gardens magazine is not sponsoring this giveaway. Aside from sending me my monthly magazine, they have no idea who I am. 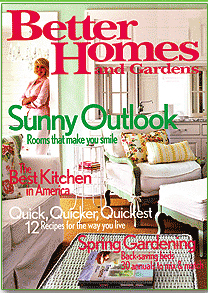 Up for grabs - a one year subscription to Better Homes & Gardens. How to enter - all you need to do is leave a comment. (You don't need to have a blog to enter, just leave a valid e-mail address in your comment.) Feel free to enter for someone else if you know someone you think would like a one year subscription to BH&G. You don't need to be a follower to enter, and you don't need to pledge your firstborn to me either. Closes - Monday, November 1. I will announce the winners shortly after, and I will also contact you through e-mail. And should I only get two entrants in this giveaway...well....you win! pick me, pick me!!!!! i love that magazine! ok...you have two....you can close it now!!! Not really!!! I'd love this magazine....and I don't subscribe to it...and I don't have any idea why!! Thanks for the chance. Well, oops, I never was that great at reading ALL the directions.....my email is Misc4t@aol.com. Hi, My name is Trinity and I've never had my very own subscription to Better Homes and Gardens :( haha..
Fun! What a nice and generous idea! Great giveaway idea!! I love BH&G but don't have a subscription. Greatest idea ever. I love BH&G! Oooh, I would LOVE to win this giveaway. I would love a subscription!! Matt and I (well really me more than Matt lol) could use some ideas for the house we just bought a few months. Ellenkfritz@comcast.net Thanks! !